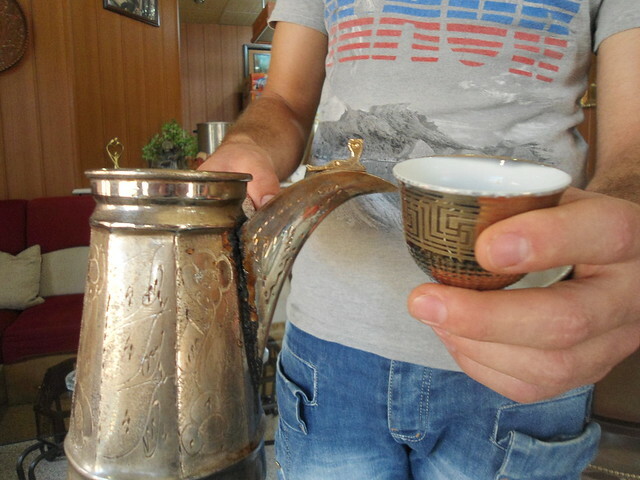 Arabic coffee. With all that may go wrong in the world, nothing can beat the soothing ritual of that perfect cup of coffee. This coffee is served just a teensy bit at a time. It’s simmered for six or seven hours, then kept to sit for a month or more, becoming more mellow and rich the longer it sits. This coffee that I had was aged for a month! It’s spiced with cardamon and is not sweetened. You are supposed to indicate that you don’t want a refill by shaking your cup, otherwise they keep refilling and refilling.. I didn’t know. Next time! I love your coffee posts! This is so interesting. I never knew there was such a ritual for the aging process. What does the title “Qahwa” mean? Beautiful pot and cup !! I love your coffee posts, too. Haha– after so many refills, did you have trouble sleeping? luckily they serve it tiiiiiiny doses, almost like a thimbleful, seriously!